Coupon Mama: I have been a black girl for a long time...so excuse the excitement!! I have been a black girl for a long time...so excuse the excitement!! 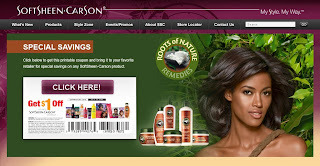 Those of you who know me...know yes I am a black girl and have been for almost 40 years so imagine my excitement when I see a Soft Sheen Carson coupon..that doesn't expire until the summer. Not many of you will be excited with me, but it is worth jumping up for me!!! Click here to print and share with a friend. well, I've been a black girl all my life, so I'm excited with you. espeically since the only store in our area that accepts internet coupons is super kmart. I've already saved it to my flash drive. thanks.